Here at St. Francis we strive to be a diverse and nurturing faith community, radiating God’s love and peace in our ministry to the world, and welcoming everyone to active worship and service. We welcome everyone to worship God together, to be transformed by the Holy Spirit and each other, and to share the light of Christ in the world. 10 a.m. – Holy Communion (Rite II), with full choir, Main Church. 12:10 p.m. – Holy Communion (Rite I), Chapel. Parking is available on Via Rosa itself, or in our parking lot down the hill at the end of the street. Disabled parking is marked right next to the main entrance on Via Rosa. For very busy events there is additional parking on local streets – eg. Paseo De La Playa. 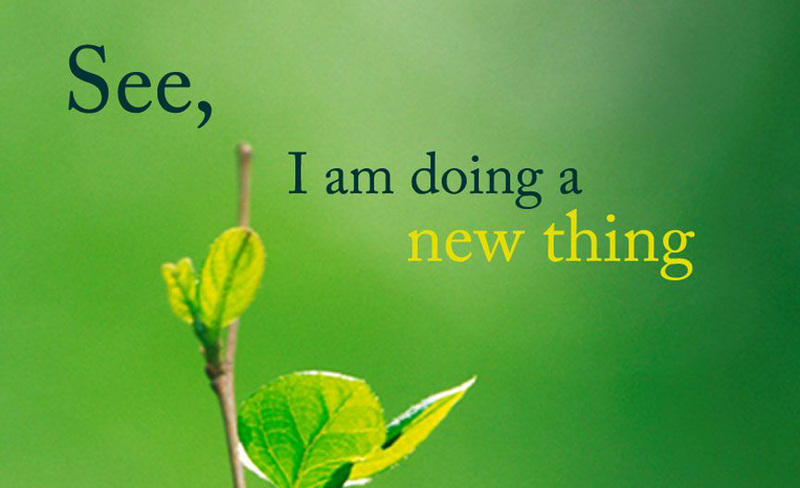 God is doing a new thing…right now. Healing and Wholeness Taizé for Holy Week —Tuesday at 7:00 p.m. Simple music and chants by candlelight, with the chance to speak privately with a prayer leader. 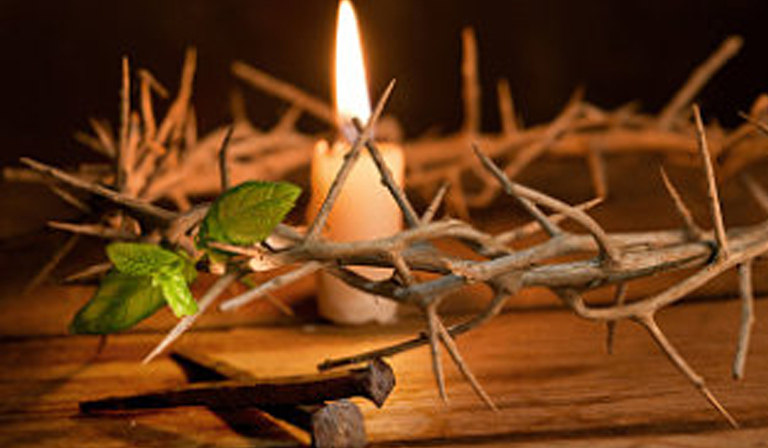 Holy week Eucharist—Wednesday at 12:10. Center yourself with this mid-week Holy Communion. Maundy Thursday – April 18, 6:30 p.m.
Light Dinner/Communion, washing of the Altar, and time for individual prayer. Walk our beautiful stained glass panels, hand-made by members of our congregation. Scripture readings, candles and music, with the offer an anointing with holy oil as a symbol of our baptismal covenant. 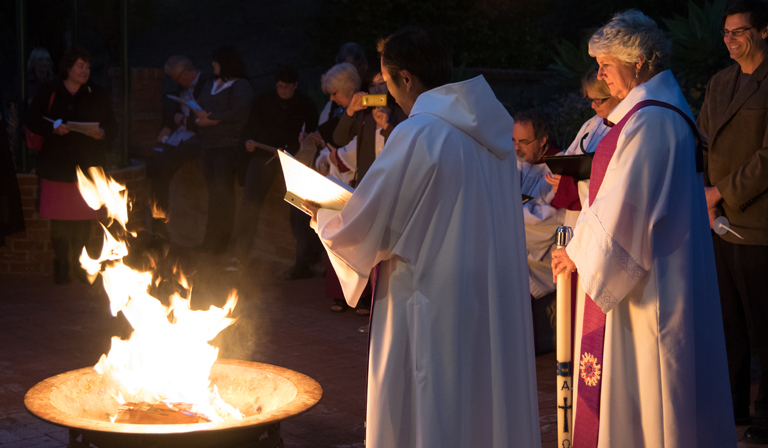 The new fire of Easter is started, outside on our patio, from which the Paschal candle is lit. The dark sanctuary gives way to the lighting of candles, and ringing of bells, with Holy Eucharist, as the service celebrates the first Easters of the early Christians, when new Christians were baptized into the faith. 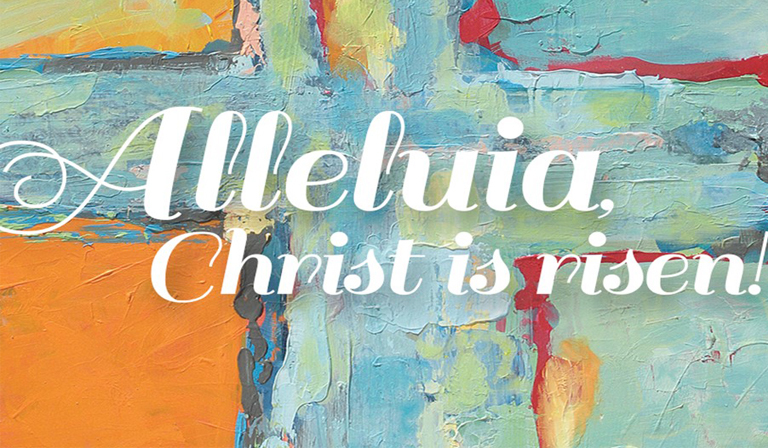 The glorious music and resurrection readings of Easter Sunday are celebrated with full choir, brass and organ. 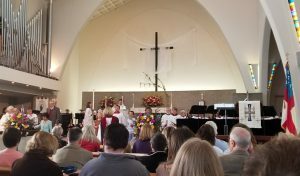 The 10 a.m. service is followed by an Easter egg hunt for the kids while families enjoy Easter refreshments. Keep up to date – sign up for our weekly enews, and monthly Bellringer straight to your inbox (unsubscribe at any time).